Man, it's been hard to get back in a blogging groove. In part because the sore-throat fairy seems to have paid me another visit. No fever this time, but worse pain. What's up with that?!? But I won't whine. 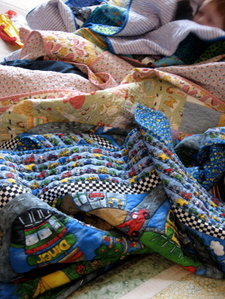 Not the best picture to actually show you the quilts, I realize, but I took these photos of the kids all wrapped up to send as a thank-you note - they're the best I've got. 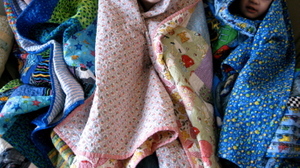 Thomas' (left above) is hot rod fabric mixed with brights, in big blocks. Princess' is this amazing retro paperdoll fabric set with 30's reproduction prints. 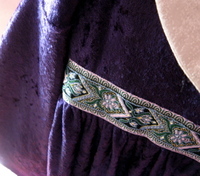 And the border is one of the large-scale ones. So so pretty.... and I'm looking at it and realizing you can mostly see the back. Sorry! Monkey's is a panel with roads, with coordinating car and checker fabric. Really fun. The kids LOVE them. 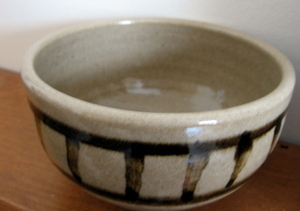 From my brother, Karl, a handmade bowl by his friend, Greg. A very cool gift. My mom made the kids dress up clothes. 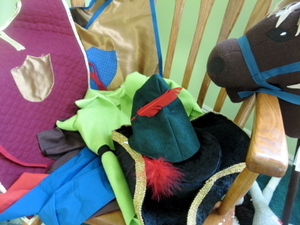 For the boys, tunics, knight's tops, capes, a Peter Pan top, Peter Pan/Robin Hood/Prince Phillip hats, and more. The cool thing is she found a lot of the fabric for all this stuff from the remnant bin at Joann's. Sweet. And there is more, the boys wear them around and take them off wherever - so this is what I could gather this morning. :) She didn't make the deluxe pirate hat or the horse on a stick (IKEA) that Monkey has named 'Charlie'. 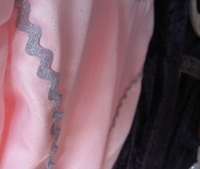 For Princess, she made two Medieval-inspired Princess dresses. She has recently grown out of all her gorgeous dress up clothes that my mom has made her. She is in love with both of them, and on Christmas day she probably changed outfits 8 times. 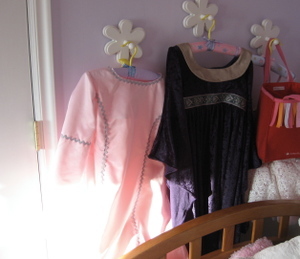 Mom also threw in a few more lovelies, not pictured, in the form of sparkly skirts, lace shawls, an embroidered stole. Princess and her friends have been having a ball - quite literally. All the handmade love makes me happy, the kids' rooms look great, and hey - Halloween just might be covered!